Professor Emeritus Dr. Norm Schul and his wife, Marianne ‘73, recently made a major gift to the Urban Institute to establish the Marianne & Norman W. Schul Urban Institute Forum Series. The announcement of the Institute’s first endowed gift was made by Chancellor Philip L. Dubois on November 13 at Center City where nationally-recognized writers James & Deborah Fallows discussed their new book “Our Towns: A 100,000 Mile Journey into the Heart of America.” The talk was sponsored by the Urban Institute. The Marianne & Norman W. Schul Urban Institute Forum Series will be an annual event, bringing regional leaders together with national experts to examine policy issues impacting the Charlotte region, informed by research that will be conducted by the Urban Institute and other University researchers. The inaugural series will be held in late 2019 or early 2020, and will be one of the signature events associated with the Institute’s 50th anniversary celebration. 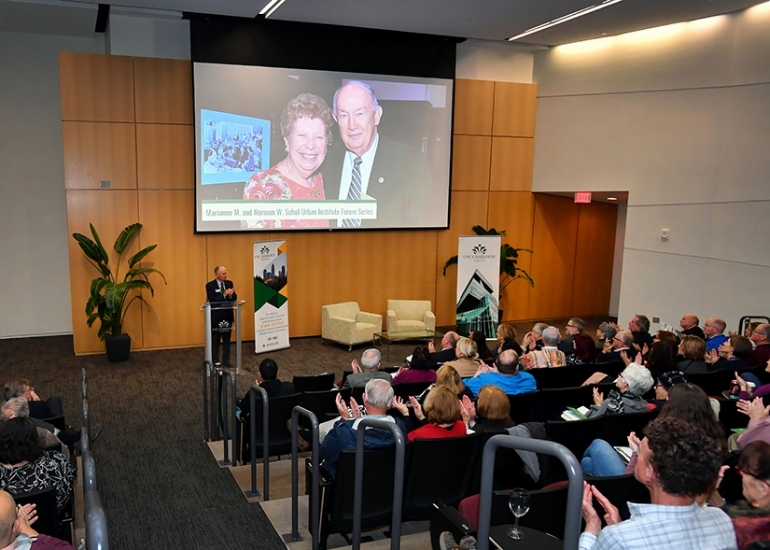 “The forum series will bring national speakers and expert panelists together to address major policy issues facing the Charlotte region, and will continue the Institute’s historic mission – which Norm himself helped establish 50 years ago – of linking university research with community dialogue to enhance the Charlotte region's quality of life,” said Chancellor Dubois. Dr. Schul devoted his career to building programs at UNC Charlotte. Over the course of his four decades at the University, Schul was involved in founding a host of pioneering programs, primarily in the social and behavioral sciences and engineering, which have distinguished UNC Charlotte as a major urban research university. In addition to serving as chair of the Geography and Earth Sciences Department and serving as a college dean, Schul was instrumental in the development of the Urban Institute. UNC Charlotte’s Urban Institute is a nonpartisan, applied research and community outreach institute seeking solutions to the social, economic and environmental challenges facing our communities.